What could be more American than the 44 magnum? One of the most powerful revolver rounds ever made, this 240 grain Semi Jacketed Soft point standard pressure loading by Magtech is boasting 1,180 feet per second and an impressive 742 foot lbs of energy at the muzzle. This round is estimated to lose only 8 inches of elevation at 100 yards down range. This will make a long shot at 100 yards very manageable, yet still providing a good test of skill for you with your revolver. These results were gathered from a 4 inch test barrel for a realistic representation of what you can expect out of your personal revolver. 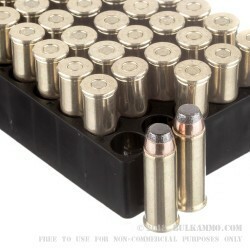 This 44 mag ammo was designed for anything from plinking, to serious training, all the way to hunting. The partial exposed soft point allows it to expand on impact, but will hold together for better penetration than a non jacketed projectile, and allow for a great amount of energy transfer which is what makes this round ideal for hunting. 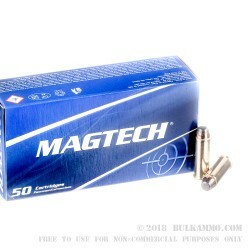 Magtech has been making high quality ammunition for various purposes for a long time, so you can trust that you will get a high quality product at a fair price. Give this 44 magnum load a chance to show you what it can do, and why this caliber is truly iconic. Q: You have a large selection of the .44 mag rounds. So many choices!! (Thanks!!) The question: Is there some sort of rating chart comparing the rounds of similar weights regarding performance and/or any other considerations I might not know anything about? Thanks! A: Right now we don't have a rating chart, but we're always working to improve customer experience and the information that we deliver to customers. As for this particular load, it would be a good choice for hunting thin-skinned game such as deer. Q: Is this brass suitable for reloading? 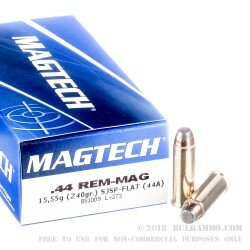 A: Yes, the brass used for this Magtech 44 Mag ammo is eminently suitable for reloading. Q: can this be shot out of a desert eagle? A: All Mag Tech ammunition conforms to SAAMI specs. 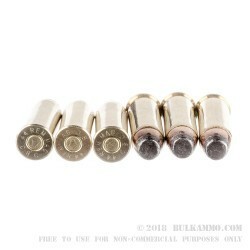 If your firearm is chambered to fire .44 Magnum, then it can shoot this ammunition. Refer to your owners manual for more details.